First flywheel had cracks nearly identical to the picture posted by fotoguzzi. Did this thread just die? I've got a '01 Rosso Mandello in Norway with 25000 km on it and no clutch issues. However scared as I am from all the rumors of cracked fly wheel I have purchased a RAM clutch and are planning replace it sometimes during the winter. If this is such a big problem both in the stand point of mechanical failure and of what could be personal injury has not Moto Guzzi made this right under warranty? Or have they simply not been sued for a faulty product as of yet? Scura #300, clutch replaced by previous owner at 15.000km. Yer new to Guzzi ain't ya? There is that . . . 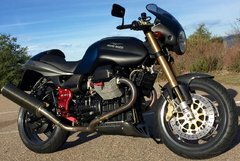 Yet, in all fairness, I am much, much less enamored with my BMW ownership than what Moto Guzzi has done during my ownership experience. Part of that was the effort of my (fabulous) dealer; part also a willingness toward "owner involvement." While Guzzi production numbers in the V11 series have yet to be published (to my knowledge ), how many units could possibly be involved with aluminum flywheels (2001 Rosso Mandello, 2002 Scura and Tenni), perhaps as many as 2500? Or fewer? My numbers (just notes from different forums): LeMans Tenni 170, Rosso Mandello 300, Scura 700 = 1170. Plus the "additional" 300 un-numbered Rosso Mandello = 1470? I don't have a link, but it was true. After the "limited edition" sold so well, they made another run. Guzzi, you gotta love em.. I thought that was "common knowledge." I do recall distinctly the disappointment of "Limited Edition/ Numbered" Rosso Mandello owners being less than impressed when another 300 (?) Rosso Mandello were produced. How accurate can we say the 170 Tenni and 700 Scura are? I think the 700 Scura count is pretty good. Number plates in the registry range from 8 to 688.
at least we have a fairly concise list for Tenni. No one chimes in from somewhere in the world with "I have one with no number" or "I have #207"